This is a small area within modern Pembrokeshire lying between the sea-cliffs of Cemaes Head and the Teifi estuary. It comprises a system of small and medium-sized pasture fields and dispersed farmsteads, either side of a steep valley, Cwm yr Esgyr. A large number of burnt mounds, of possible prehistoric date, attest early occupation of the area. During the historic period, the area lay within the medieval Cantref Cemaes, in Is-Nyfer commote, in the division of Uwch Clydach. Cemaes and had been brought under Anglo-Norman control by Robert FitzMartin in c.1100 and reconstituted as the Barony of Cemais. Cemais remained a marcher lordship, administered from Nevern castle, and then from Newport Castle, until 1536, when the barony was incorporated into Pembrokeshire as the Hundred of Cemaes. However, most of Is-Nyfer represented the ‘Welshry’ of the barony and remained subject to Welsh law, custom and tenurial patterns throughout the medieval period, many of which persisted into the 20th century. This northeastern part of Is-Nyfer was, moreover, held by the Welsh princes between 1191 and 1201, and again in 1215-1223. Welsh tenurial patterns have been largely responsible for the dispersed settlement within the region. A significant early medieval presence within this landscape is indicated by the undated cist graves which have been exposed at Penrhyn Castle and Penrhyn-bach. There is no evidence that the cemetery was ever enclosed, or developed with the addition of a chapel, and it may be very early. Subsequently, the character area came to lie within the parish of St Dogmaels, which was formally established after c.1100. The parish was coterminous with the manor, which comprised one knight’s fee held of the barony, as ‘St Dogmaels patria alias Cassia’, by the abbots of St Dogmaels. The possible medieval vill at Granant, referred to as the ‘caput of Granant alias Hendre’ in the 16th century, straddles this area. However, not being ‘parcel’ of the barony, the manor of St Dogmaels was not included in the detailed assessment of 1594 that survives as the ‘Extent of Cemaes’. At the dissolution, it passed to John Bradshaw of Presteigne who had purchased the abbey in 1543. The Manor of St Dogmaels survived into the 19th century. It had been acquired by the Neuadd Trefawr estate during the 17th century and was sold to David Davies of Castle Green, Cardigan, in 1862. None of the other c.15 dispersed farmsteads now present is recorded before the 18th century, and Penrhyn Castle mansion appears to be an entirely new establishment of the 19th century, though some are likely to have earlier origins. The present pattern of fields appears to belong to two distinct periods of enclosure. A system of small, irregular fields can be seen within Cwm yr Esgyr, particularly on the south-facing side of the valley, and in the eastern half of the area. 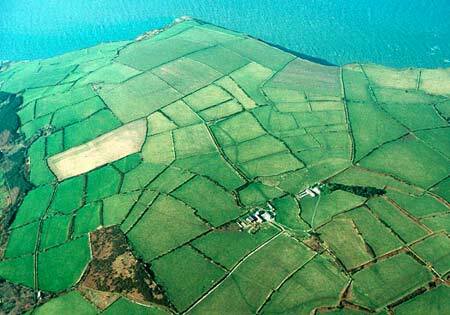 These are associated with the densest concentration of farmsteads and appear to belong to early post-medieval, if not late medieval enclosure under Welsh tenure. To the west of this system, the higher ground - which slopes up to the sea cliffs - is characterised by larger, more regular fields. This part of the area may have been unenclosed grazing until the later post-medieval period, but had been enclosed by the time of the tithe survey of 1838. A small lifeboat station was established on the Teifi estuary. Subsequent development has been associated with leisure. Poppit Sands, at the mouth of Cwm yr Esgyr, occupies a scenic estuary setting with extensive sands, which are very popular with visitors. A caravan park and its services, and 20th century beach houses associated with a pocket of sand-dunes, are the dominant feature of the landscape here. 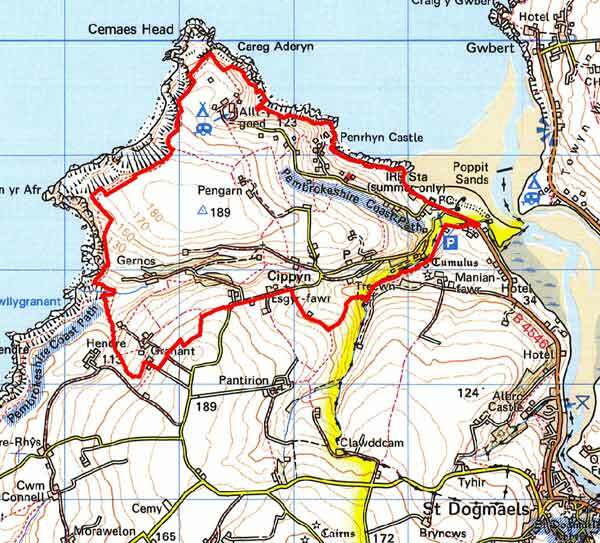 Meanwhile, the Pembrokeshire Coast Path, designated in 1952, runs along the cliff-top here giving unrivalled access to coastal scenery, and a Youth Hostel is situated within this area. Cippyn historic landscape character area lies at the extreme western end of the Teifi valley to the south of the river. It runs down to the tidal estuary on its northeastern side and rises to over 180m above sea level. 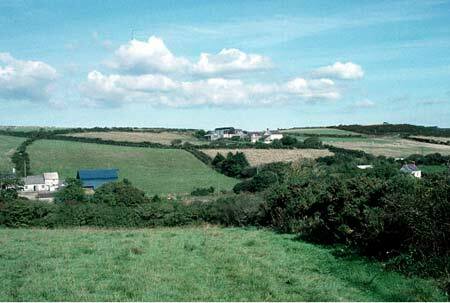 Its western flanks and highest points are exposed to the Atlantic gales; no trees and few bushes stand here. The steep northeast-facing coastal slope and the steep valley sides of Cwm yr Esgyr provide the only shelter spots; here there is some scrubby deciduous woodland and bracken/gorse covered slopes. It is an agricultural area with improved pasture. On the higher, exposed parts stony banks bound the medium-sized irregular fields. Hedges, where present, are straggling lines of low gorse bushes. Hedges, many of them overgrown or reduced to straggling lines of bushes, survive on the earth and earth/stone banks in more sheltered locations. Farms, smallholdings and cottages are fairly densely scattered across the more sheltered slopes, with just a few farms and two small 19th century chapels in exposed locations. Apart from the formal ‘Georgian’ proportions to the early 19th century two-storey stone rubble listed house at Bryntirion, dwellings are small, and probably date to the latter half of the 19th century. Houses are two storey with a three-window front. Generally their low elevations and small window opening owe more to the vernacular tradition than the polite Georgian style. Single-storey cottages are also present, including a listed example in poor condition. Locally-sourced stone, not Teifi valley slate is common in the lower Teifi valley, is the main building material. This is invariably cement-rendered on houses, but left bare on agricultural outbuildings. These agricultural buildings are also small, comprising just one or two ranges, and in some cases a single range, in line with the dwelling. Some have been converted to non-agricultural use, and many are in poor condition. Modern farm buildings are few and generally small, with many of the smallholdings not now engaged in agriculture. A few post World War 2 home-made houses, and beach houses, are situated at Poppit. Also here is a small caravan park, a lifeboat station, a tourist car park and other facilities. The absence of trees and to some extent hedges, the stony boundary banks, the small nature of the houses and farms characterise this area and the general absence of modern development distinguishes it from its neighbours. It is therefore a distinctive area.